Size : 60 x 80 Cm. Feature of Flip Chart 60 x 80 Cm. Specification of Flip Chart 60 x 80 Cm. 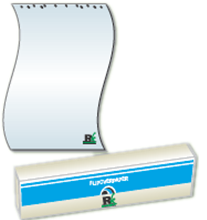 A flip chart is a Stationery item consisting of a pad of large paper sheets. It is typically fixed to the upper edge of a Whiteboard, typically supported on a tripod or four-legged easel. Such charts are commonly used for Presentations.